This is an “All Aluminum” Top Drive. This is a Nilgai Rig. 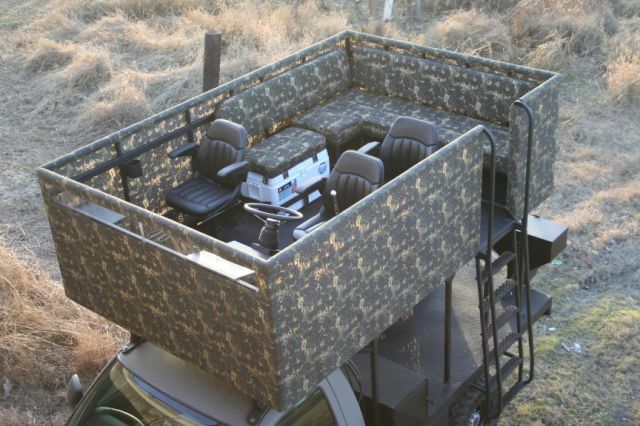 This truck is specifically designed for hunting Nilgai on the go. It has two front Varmint style swivel chairs for accurate shooting on the go. It also has 2 rear buckets and a Center driving station that is a full hydraulic, drive by wire set up. 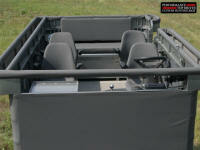 This one has a rear game ramp and winch seat up for easy loading those heavy animals. Very Nice Rig. Can be Hydraulic or Shaft steering. 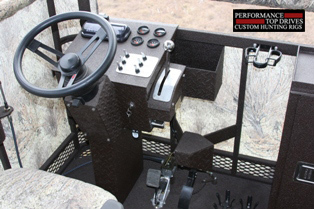 This is our best top drive set up using a fully enclosed column, tilt wheel steering, hydraulic brakes, floor mounted electronic accelerator pedal, hand throttle, column mounted transmission shifter, gauges, and a radio. 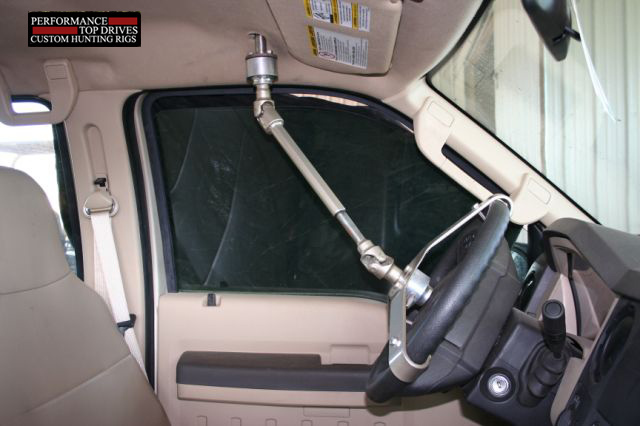 We offer Hydraulic Steering or Shaft Steering and this steering column will accept either system. Our top drive systems are user friendly like an automobile should be. Can be Hydraulic or Shaft steering. 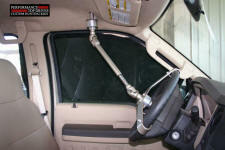 This is our regular Top Drive steering column set up. This has the smaller steering column, non tilt steering, floor mounted transmission shifter, hydraulic brakes, electronic floor mounted accelerator pedal and a hand throttle. We also offer this column with hydraulic or shaft steering. This Top Drive system operates just as good as the full column system but without tilt wheel steering. 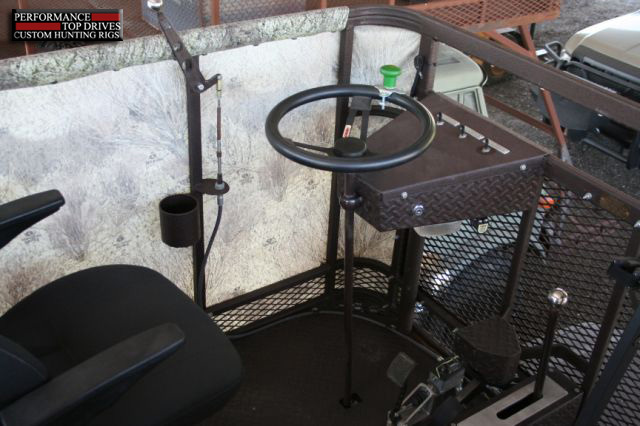 This top drive deer hunting truck setup is shown with these options; tilt wheel steering, full gauges, radio, hand and foot throttle, floor shifter, hydraulic brakes, cup holders, storage trays, hunting gun mounts and swivel chairs with arm rests. Perfect for South Texas Outfitters and individuals top drive hunting trucks. This shows our hand throttle design to ease your top drive hunting truck driving experience. All of our deer and quail hunting rigs custom features are built for durability, light weight, functionality and years of quality service. 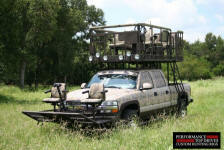 Get yours and find out why south Texas outfitters and individuals hunters choose Performance Top Drives. This shows the way that we construct a removable hunting top drive. All of our hoses and cables are built with quick disconnects. 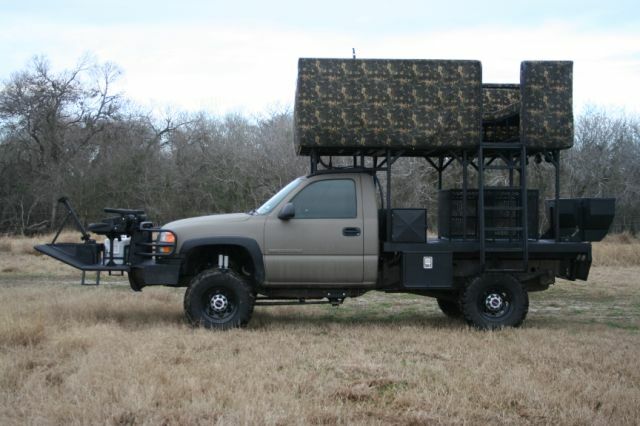 All you need is a hoist to lift the hunting truck top rack off and you are ready to drive your custom quail and deer hunting truck the rest of the season. This is just one of our many quality features. This is our quick disconnect for the lower steering wheel when a shaft steering system is used. It takes about 20 seconds to remove this shaft by simply pushing 2 release buttons and driving away. We also use fully hydraulic steering systems which do not use a steering shaft at all. In a fully hydraulic steering system the driver just needs to start the truck from down or up stairs and simply drive off. Our systems are user friendly. 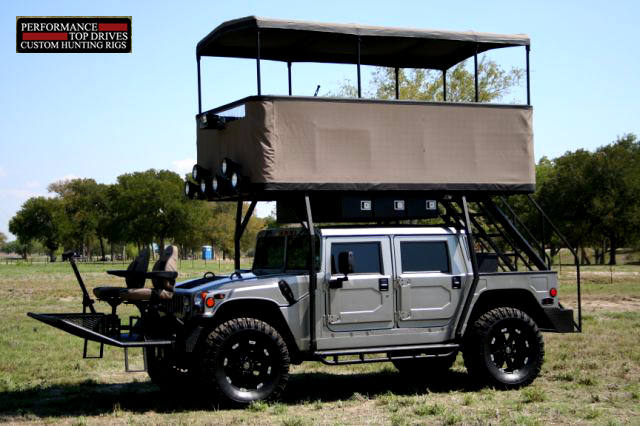 This is a Hummer H2 rig. This is to impress the client. This truck has everything you will need whether you are hunting or just entertaining. Only The Best Will Do. This used to be a Chevy Dually but we converted it to a single wheel and installed a 14” suspension lift with 42” Tires. This is a full top drive unit that seats 12 people. This truck has it all, including a slide out bar in the back seat and a bar in the top drive area. We used the factory bed and just cut it down to be more convenient and different. 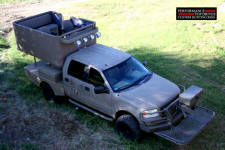 Check the trash can shoot system out in the tool box on the front part of the bed. We thought of it all. My head hurt after designing this one. 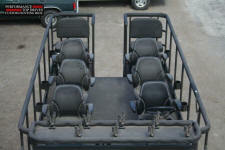 This shows our 7 passenger top drive hunting rack. 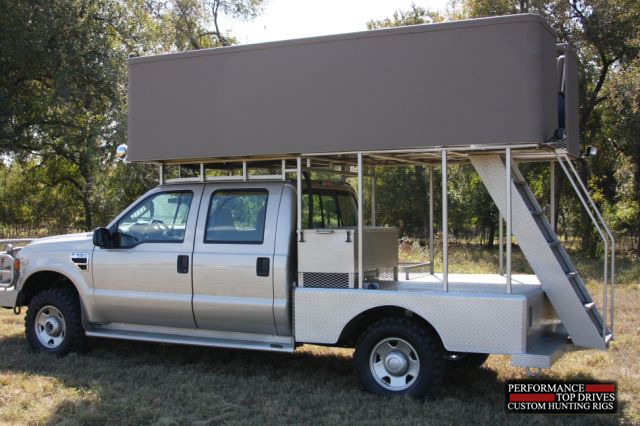 Notice our outside cage option on both sides of this top rack and our large front windshield in order to see the front of the custom hunting truck while driving. The little things that we do here at Performance Top Drives, like this windshield on this unit is what makes us the Leaders in Top Drives. “THE PERFECT RIG” This is a Hummer H1 Pick Up style truck with our 11 Passenger Top Drive set up, roof and front quail seats. This unit is loaded with special options and is Built so the Complete top drive unit can be removed and stored in the Summer months so the Hummer can be used for other activities. We install lift kits and tires to transform vehicles to your specifications. This is a 2007 Chevy Top Drive with a 6 inch lift kit completely camo’d out and with lots of very Elite options. We can make our top drives very Elite depending on the customers desires. Check out the nice cork flooring we use on some models. No matter what you are looking for Performance Top Drives can Build It. We specialize in very custom rigs with lots of character. “FOR THE OAK TREE RANCHES” This is our very unique LOW top drive. This is used when you have large trees and need to stay under the limbs but still want the open air style of a Top Drive. This is our Hydraulic Steering Set Up. Notice the Raised “Logo” in the door. Isn’t that the coolest. 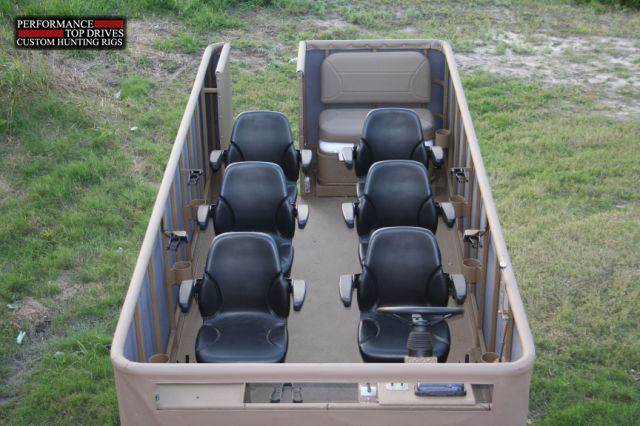 This is a 12 passenger top drive set up. 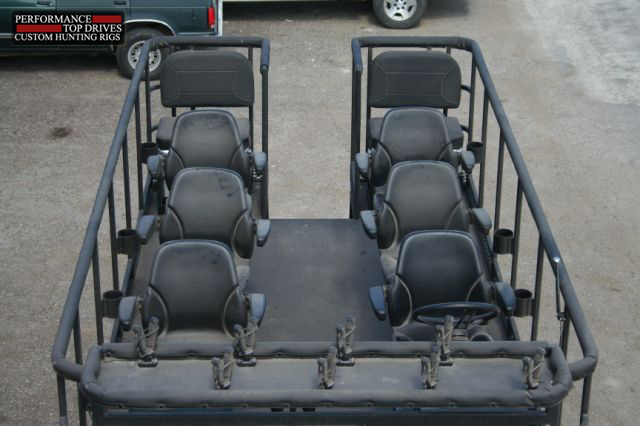 This has 5 bucket seats and an “L” bench seat. We used the factor bed, not a flat bed. This is very comfortable, functional rig. This is a 2006 H2 Hummer Top Drive with an electric adjustable roof. This unit can be raised up high enough to stand up in and will also close completely sealing off the unit, all with a flip of a switch. Now isn’t that cool!!! Oh, and also lots of drink holders!!! 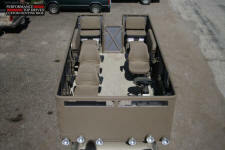 This is a top view of our 8 passenger top drive with a rear entry ladder. 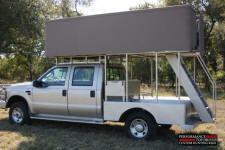 Corporate deer hunting, quail hunting rigs and custom hunting trucks are built one at a time here at shop. We use the finest material available and paint or use spray in bed liner to coat all new materials. Both of these pictures is of the same length rack but one is with a “center rear entry” ladder with 8 individual chairs and the other is a “side rear entry” ladder with 6 individual chairs and a single rear 2 person seat ice chest seat combo. 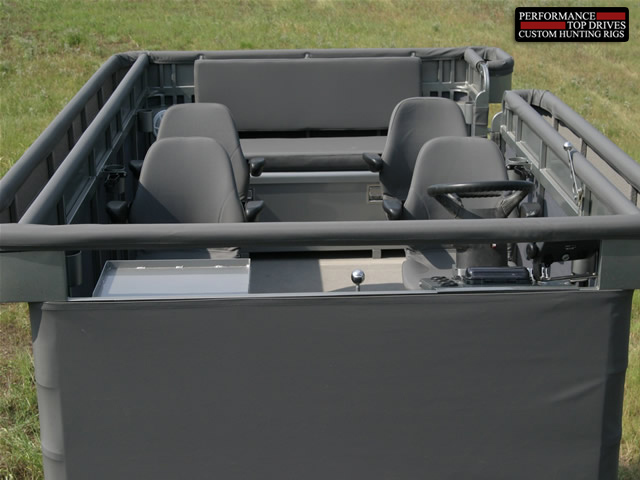 Notice the “center rear entry” ladder rack is wider to better accommodate the double rear ice chest seats and also notice the difference of the width between the bucket seats. What ever style of seating arrangements you need, we can produce. We are very aware of utilizing all available space wisely. This is a Chevy 2500 HD 4x4. This is built “Old School Look” with the squared corners and open flat bed. This does however have our modern Top Drive Controls set up. We build trucks as “YOU” want it done. This top drive is on 02’ Chevy 2500 HD . All of our corners have bent tubing to accent the vehicle. 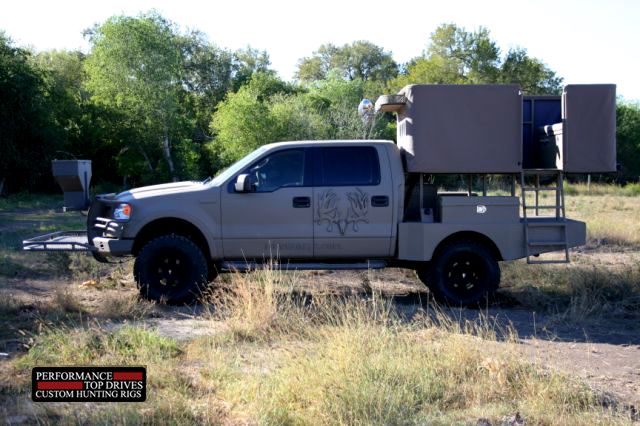 This truck is a good example of our top drive and quail rig combo. 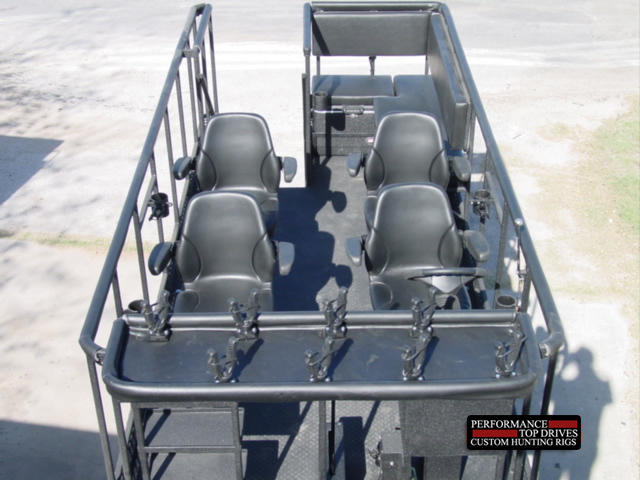 The top rack is set up with 2 high backed captain chairs with an ice chest seat and also a "L" bench seat in the back that will set 3-4 people. The rack has a side entry ladder. The quail rack on the front of the truck will set 2 people with a 2 gun rack and storage boxes for shells or birds.